Today I want to share with you another one of the gorgeous Shimmer polishes that Cindy has created! For these nails, I used two coats of Zoya Raven as a base and added one coat of Shimmer Vanessa on top. 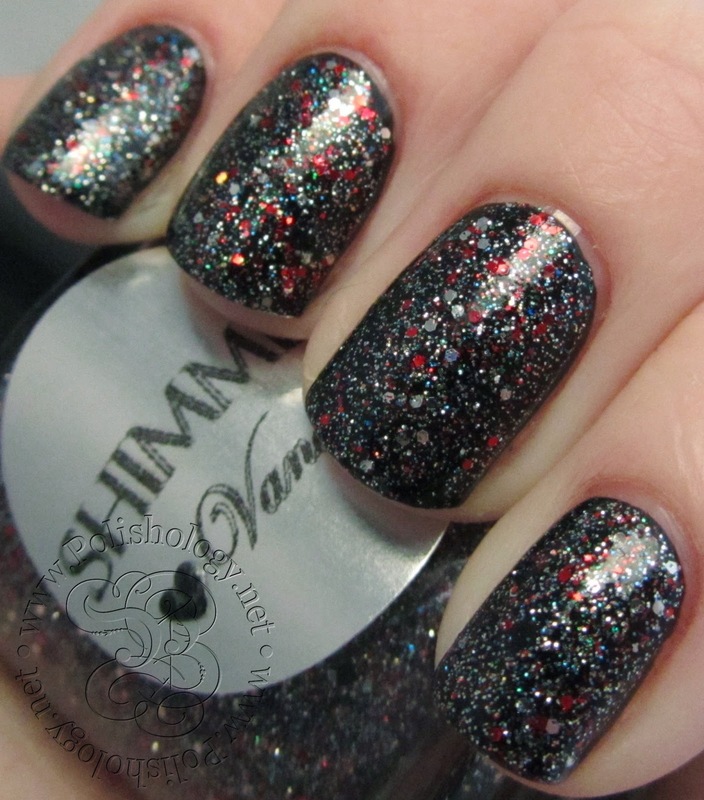 In the bottle, Vanessa seems to be mainly comprised of silver, red, and black glitters of various sizes. However, ones you get it on the nail you see that a rainbow of other colors pops up as well, especially blues and greens. Looking at this in the bottle I knew it would look fabulous over black, and I was definitely not disappointed! Vanessa applied beautifully, and as you can see the glitter is fairly dense. 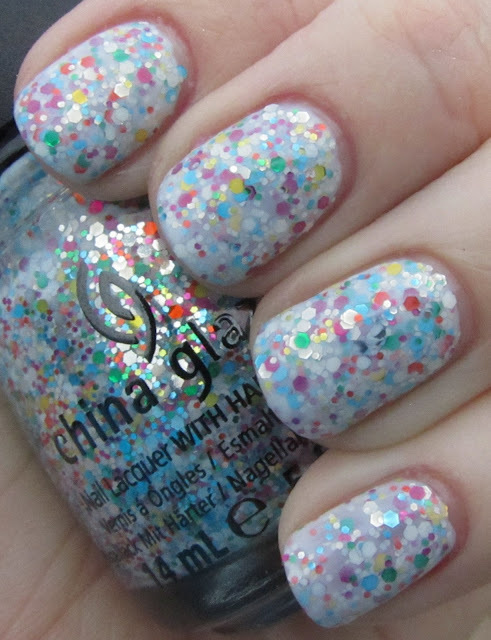 I am sure this polish would build nicely to opacity in 2-3 coats if worn alone, and is also wonderful for layering. I love that there is so much complexity and diversity in the glitters, yet they all work together so well to form a cohesive look... it really is stunning! I continue to be completely impressed with these polishes and cannot wait to share more with you! 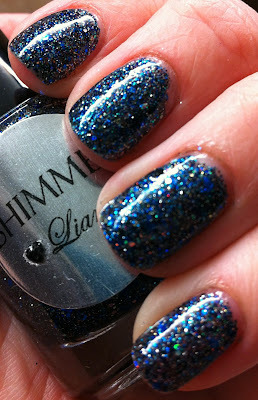 You can find Shimmer Polish at Cindy's blog, or at her Etsy Store. I definitely recommend taking a look! The polishes featured in this post were provided to Polishology for review purposes and represents my honest and unbiased opinion. I know, I know... it's not even February yet! What can I say, I was feeling in the mood for a Valentine's-themed manicure. I decided to go with some slightly less traditional colors on this one - don't worry, there will be plenty of red and pink over the next couple of weeks. For these nails, I started off with two coats of Zoya Julie, a pale, blue-toned lavender shimmer from the new Lovely collection. 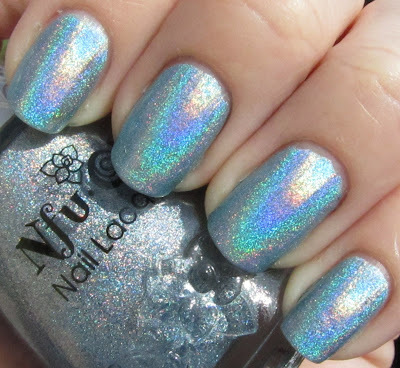 The shimmer in this is gorgeous and it applied fairly well in three coats. After that I used Zoya Neeka to stamp dark purple swirls using Konad plate m63. Then I used Konad Special White and Bundle Monster plates BM-311 and BM-303 to add the heart designs to the top. I added little white pearls from a Cheeky nail wheel to the circles on the hearts. Finally, since I clearly didn't have enough going on yet, I added a coat of OPI Pirouette My Whistle. It's a bit busy, but I love how it turned out. Today I want to share with you my selection from the China Glaze Safari collection from last fall. While I really liked quite a few of the polishes from the collection, I really had to limit myself to just one when it came out. It was a tough choice, but in the end I am super pleased with the one I picked out! China Glaze I'm Not Lion! is a light gold glitter packed with holographic glitter bits. I was drawn to this one because the color is neutral enough that when I need a more subtle look for work I can get away with it, but get it in the bright light and it comes to life! I wore this around the hospital for about a week last fall and got quite a few compliments on it. Application is fairly smooth, although it does take three coats to build to opacity. 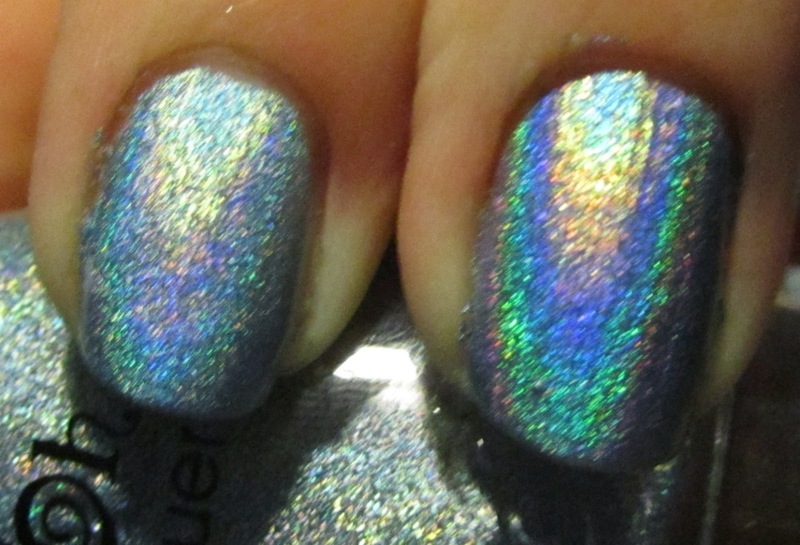 Here is a fuzzy shot for you to really see that holo shine! In low light the polish it a bit more tamed, but still really pretty. Enough of the holo still peeks out to give it a glowing look. 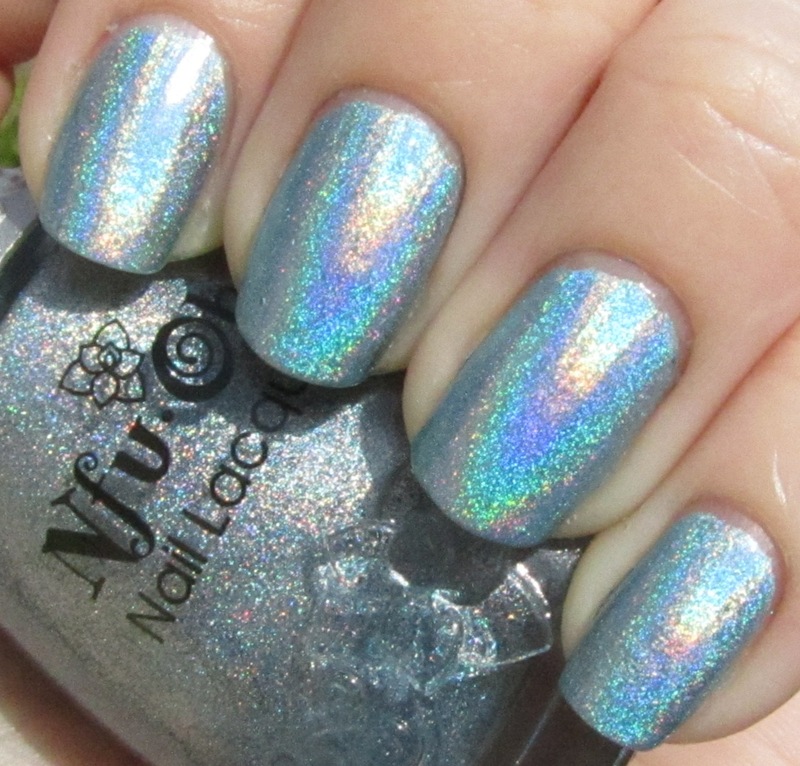 This is a great polish, perfect for any time of the year and just about any occasion. I'm very glad I chose to add it to my collection! And now for something a little bit different... I want to share with you one of Nova's Christmas presents this year, a subscription to BarkBox! I had heard of these boxes before from friends, and I know a few bloggers that get them for their pups, so after reading some reviews I finally decided to sign her up! Her first box came this past week, and I thought I'd share it with you. After waiting for this thing for over a month (I signed up in mid-December), I was super excited for it to arrive! It took awhile to get here - they are shipped the 15th of every month and it didn't get her until the 24th. I was sort of starting to wonder if it had gotten lost in the mail but it finally made it! The items are packaged in cute crinkled paper and it comes with a card describing each item. Nova was pretty excited as well - she couldn't even wait for me to get the tags off before she snatched up a toy. Yep, this toy looks good! Here are the items that were included in the January BarkBox! Nova was a pretty big fan of Elton - he was actually the first thing she grabbed out of the box! Nova is a very... proficient chewer (we cannot buy her any toys with stuffing anymore, and even the "chew-proof" toys are usually mutilated fairly fast). While Elton has lost an eyeball and is looking a little frayed around the edges, thus far I have not had to take him away from her. So that is a win in my book! I'm always sad I can't buy her cute little plush animals anymore so this is great, since he is adorable and functional. This rubber peanut-shaped toy has a whole in the end for stuffing treats and is hollow inside. I put some of the treats they sent (see below) into it and she had a lot of fun getting them out. I like that it makes her think a bit and work out how to get her treats so I'm sure I will use it with her often. She also likes to play fetch with it, so as long as the rubber holds up to her chewing (it has so far but that's no long-term guarantee with her, haha) it should get a lot of use from us. I am always on the lookout for healthy, high-reward treats for Nova. These treats really seem to fit the bill and she goes crazy for them! She is on a grain-free diet, so it's nice to find some good grain-free treats for her as well. Looks like they come in four flavors, which is nice. I would definitely consider buying more of these once they are gone! Will sit pretty for treats! I was really pleased with our first BarkBox! Nova enjoyed everything included and it is a pretty good deal. Depending on how many months you sign up for, boxes are between $18-28, and it looks like on Amazon these items total up to about $35, making it a good deal. Plus, it's always fun to get goodies in the mail - even if they are more for your dog than for you. Nova and I definitely recommend it. 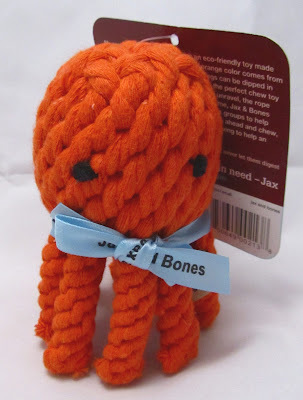 I can't wait for the February BarkBox to come out! If you Click Here or copy and paste the following link, you will get $5 off your first subscription, and help Nova to get a month of BarkBox for free! Plus you'll get your own code once you sign up. Check back for more polish tomorrow! I finally received my Zoya order from their 3-free promotion! I was so excited to finally get it - not only did I get the three free polishes, I also picked out three from the new spring collections. As I am sure none of you could have possibly guessed, I had to get the blue polish from each collection! 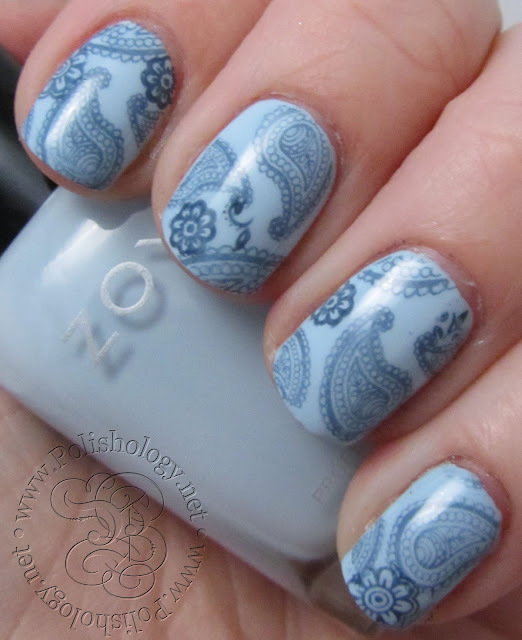 Here is a fun stamping manicure I did with two of my new polishes. I started off with two coats of Zoya Blu, a pale blue creme from the new Lovely collection. Application was fairly good and while I expected it to be somewhat streaky, I didn't really notice this problem. Granted, my bottle was still a bit cold when I put it on (I didn't wait long after getting the mail, haha). The color is very pale, almost chalky but not quite, making it unique among my collection of blue cremes. I love it! I used another new arrival, Zoya Natty from the fall collection, to add paisley print and some extra flowers using plates BM-315 and Konad m64 Very pleased with how this combination worked out. For the base I used Deborah Lippmann Waking Up In Vegas, a "greige" creme and one of my favorite go-to neutral colors. It looks fabulous with white designs and I have used it several times when I needed a more dressy, elegant look. Stamping was done with Konad Special White and plates BM-310 and m59. Just enough design to be unique, and the accent nail bow is super fun, but still a subtle look overall. 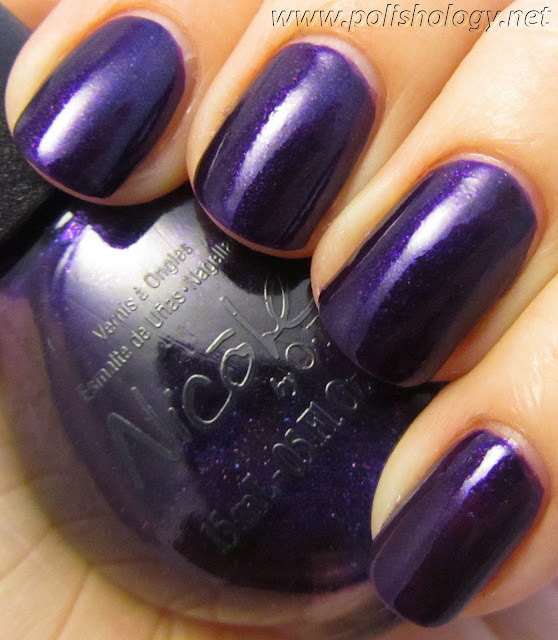 OPI Can't Let Go is a deep, blue-toned purple full of purple microglitter as well as purple medium hex glitters. The liquid sand shades are meant to be worn without topcoat, and dry to a matte, rough finish. It is bumpy to the touch but not quite as gritty as I thought it would be. The look is kind of cool, and it really does look somewhat like purple sand on your nails. That said, I had to try it out with top coat! I liked this polish matte, but I love it with top coat! It changes the color to a deeper and more vibrant purple and really makes that glitter shine. I feel like this means that I am missing the point of the liquid sand somehow... but it is still super pretty, and that is all that matters! It applied fairly well in two coats and the formula was not all that thick, which I thought it might be. As is to be expected, it eats topcoat like crazy, so be prepared! I am pretty excited now to try out the rest of the liquid sands (and the Zoya PixieDust collection). I'm interested to hear what you all think of this trend? Are you loving it or do you think it will pass quickly? Let me know what you think! Today I am thrilled to bring you four new shades from Nicole by OPI for Spring 2013! This release features two bright and cheery shades and two dark, vampy shades. All four of these looked great with two coats, which is awesome! I also decided to try out my new indoor photo setup... which basically consists of a desk lamp and a rather inexpensive photo tent. I think they turned out nice - although I am still working on tweaking it a bit! :) Enjoy! A medium red creme. Fairly standard shade, but the super smooth application made it stand out. It looked pretty good at one coat, but that second coat made it look pretty perfect! Bright, cool-toned hot pink shimmer. This polish is seriously insanely bright. As in, made-my-camera-spaz-out-a-bit bright. Think almost neon, but not quite. This will be fabulous for summer! Also, this is a matte polish - above you can see the polish with topcoat; below without. Additionally, while the press release states this is a creme, it most definitely has a subtle shimmer going on! Deep black with silver microshimmer. This seems to almost have a tiny hint of navy to it, but it is pretty much black. This one is super shiny! Dark, blue-toned purple with purple. blue, and pink microshimmer. 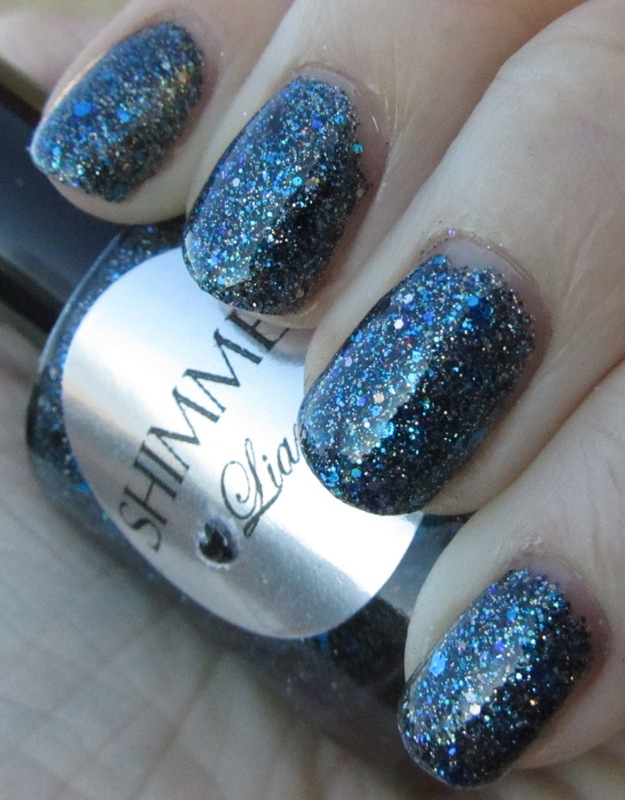 When this polish arrived, all of the shimmer was settled down at the base of the bottle. A night upside-down and some rolling solved the problem though! This one was very shiny as well. The formula on all of these was superb, I didn't have problems with a single one of them. And they are all two coaters, which is a bonus! While they are not insanely unique, it is a good collection of some necessary basics. My picks are Still Into Pink and Plum To Your Senses!, as they are the most unique. I love the matte finish and the subtle sparkle of the pink, and the delicate multi-color shimmer of the purple is really fun. The formula alone makes these worth a look in my book! Which do you plan on adding to your collection? The polishes featured in this post were provided to Polishology by OPI for review purposes. This is an honest and independent review and was in no way influenced by the company. While the entire China Glaze Cirque du Soleil collection was lovely, I only ended up with one of them, and I am so glad I added it to my collection! 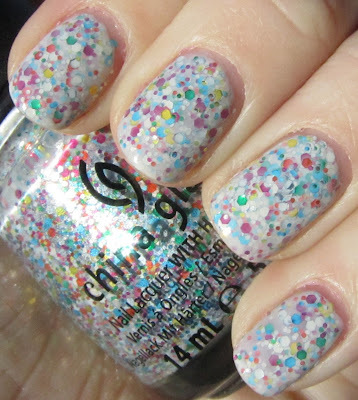 China Glaze It's a Trap-eze is a rainbow of glitter in a sheer milky base. The glitters in here include white, blue, green, orange, pink, yellow... and probably some more that I'm missing, in a variety of sizes. It's a bit on the thick side, which is to be expected with this much glitter, but applied really nicely in two coats. I realized a couple of weeks ago that I have had my old layout now since September of 2011, and I thought it might be fun to shake things up a bit and try out a new one! I looked and looked.... but I wasn't able to find one that really seemed perfect. So I decided to make one! Using a digital scrapbooking kit from Just So Scrappy I came up with this layout featuring cherries and butterflies and I am super pleased with how it turned out! I had so much fun, I am putting a layout together for Becky too. Thanks to my wonderful husband Dan for his help with some of the HTML/CSS work that went into getting everything to look right! Of course, a new layout means new kitty pictures! Shockingly (or not), Leo wasn't too cooperative - the only way to get good pictures of him is to catch him naturally, it's hard to get him on a particular background. Plus I swear he hates the camera. Luna hammed it up like always. Here are some of the most fun outtakes from the session. Leo giving me a death glare. Overall he was just not too pleased with the situation. He's such a handsome boy. Too bad he hates getting his picture taken. She was looking at me right before I took this - would have been a great shot! And... I think we're done. If you enjoy kitty pictures, I posted a few more outtakes on my new Facebook page - feel free to check it out and like us there! I plan on posting all new manicures there, as well as previews and possibly some special giveaways... more to come on this later! 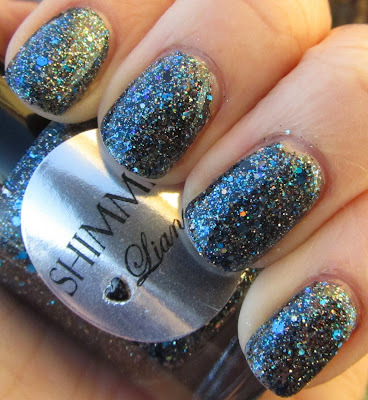 Shimmer Liana is a gorgeous midnight blue glitter bomb. This polish is made up of predominantly dark and medium blue, black, and silver glitters in a variety of size. Some of the silver glitter is also holographic, which makes this sparkle like crazy in sun and artificial light! 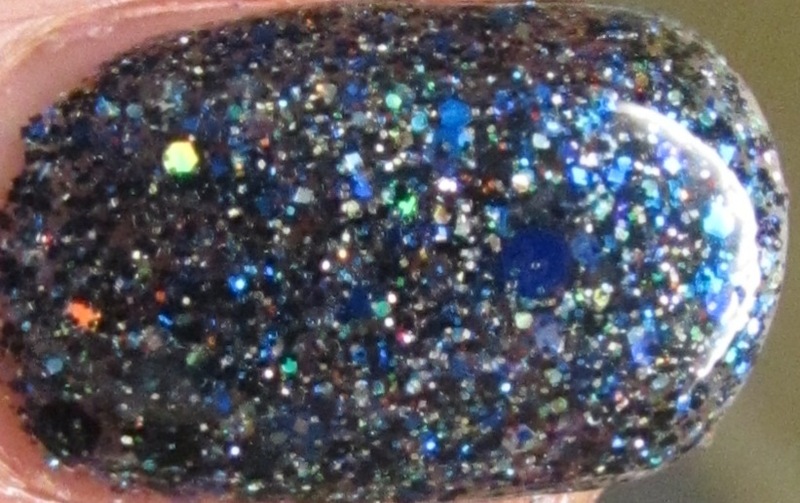 Application was a little on the thick side, which is sort of to be expected for a polish with this much glitter packed into it. While a bit thick, I didn't really have much of a problem with it and it applied very nicely for a glitter! Three coats for full coverage. 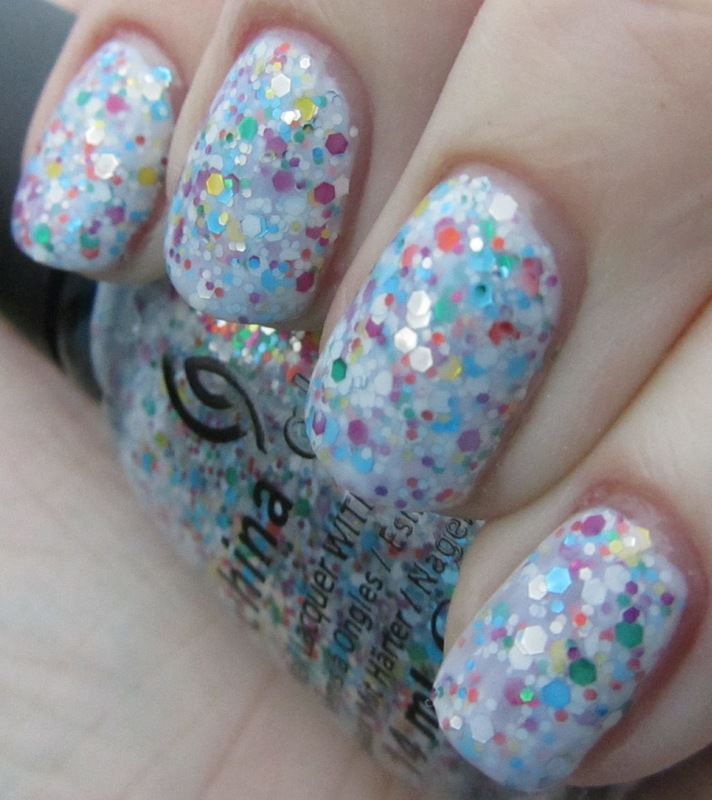 This would also work really nice as a layering polish. I felt like my camera wanted to focus on the black and silver more than the blue at times on this one. It actually looks very blue in person. While this picture is blurry and the lighting gave me horrible lobster hands, it caught a bit more of the blue as well as the holographic sparkle. 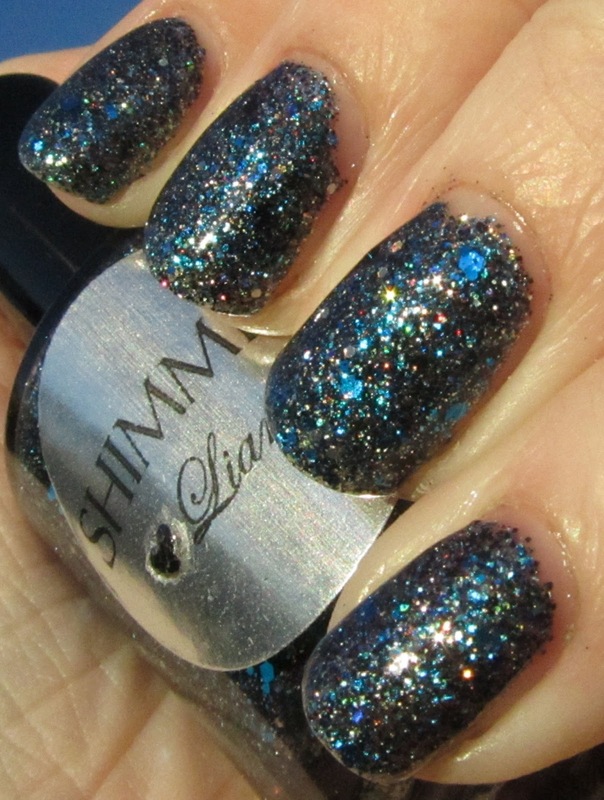 I love the combination of glitters in this - blue and black has always been a favorite of mine. I was really impressed with Liana and can't want to try out some of the other glitters from Shimmer! 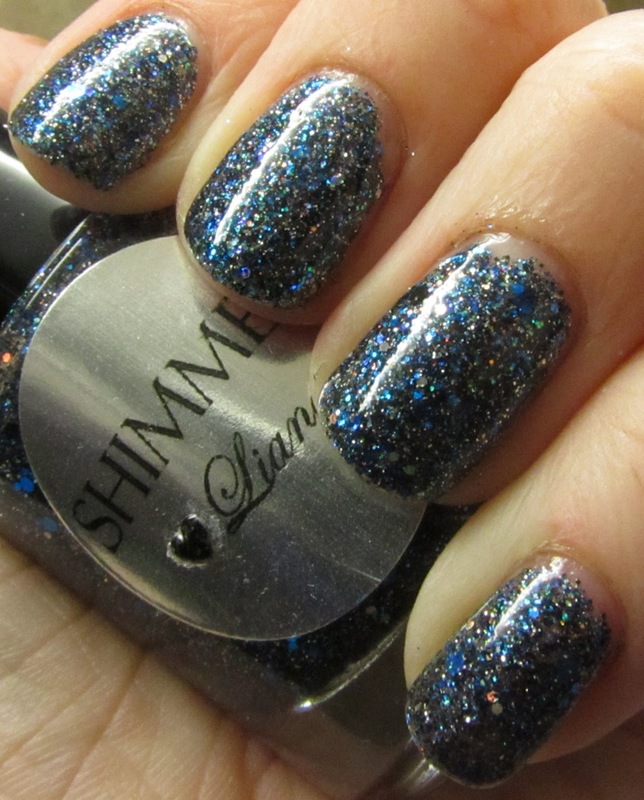 If you are interested in Liana or any other Shimmer polish, check out Cindy's Etsy store or her blog for more information! The polishes featured in this post were provided to Polishology for review purposes. Here is a gorgeous polish that needs little introduction... the fabulous Nfu Oh 65, a bright sky blue holographic.